Leaving Sarajevo, our next destination would be the rural area around a small border town called Foca for a rafting adventure. There was no need to rush the drive to Foca, so we decided to linger around Sarajevo a bit longer before setting out on the road. We headed up the hill to explore one of the most famous abandoned attractions in the city, the Sarajevo Olympic Bobsled Track. We had gotten little taste of this cool environment a few days before on our Meet Bosnia tour, but felt the area was worth a bit more exploration. The entire hilltop was gorgeous to hike around, and the serpentine, concrete form of the track weaving its way in and out of the forested hillside was pleasingly surreal. Construction of the track for the Sarajevo Winter Olympics was completed in 1982 at a cost of $8,500,000 USD. 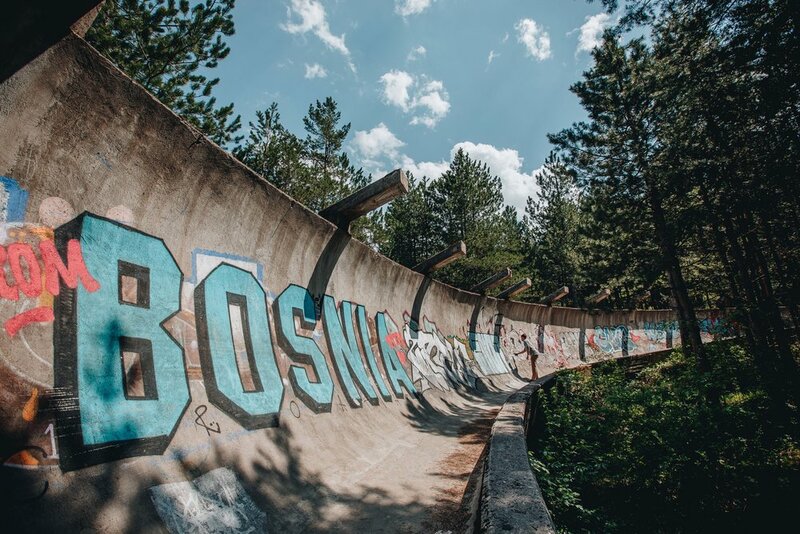 Aside from its use in the Olympics, the track hosted a handful of bobsledding and luging world cup competitions until the Yugoslav wars broke out in 1991. During the Bosnian War the track served as an artillery position for the Serb forces at the time of the Seige, as they rained down an average of 300 bombs per day on downtown Sarajevo. Evidence of its wartime utility remains on the final turn of the course, where drilled-out fighting holes still pockmark its concrete flanks. After the war ended the area became an underground attraction and a practice ground for local and touring graffiti and street-artists. The future of the track seems a bit murky. The Sarajevo Cable Car resumed operation for the first time since the early 90’s this past April, 2018, and ferries tourists up the hill to a currently undeveloped area near the track. Although more development is likely planned for this hilltop, currently the bobsled track is experiencing a breath of new life as many of the cable-car riders find their way over for a bit of exploration and hiking. After a leisurely afternoon of driving we arrived at a small rafting camp near the border of Montenegro called Divlja Rijeka. It sits on the heavily forested confluence of the aggressively aquamarine Piva and Tara rivers deep in the Tara Canyon. The gorgeous ravine is protected as a UNESCO World Heritage Site and is 4,300 ft deep at its lowest point, making it one of the deepest river canyons in the world. 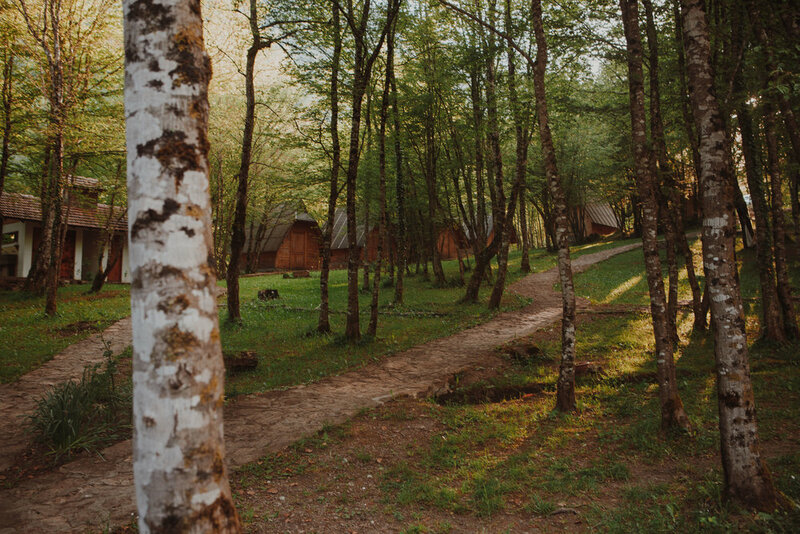 The camp consisted of modest A-frame cabins and a lodge-like common area which dispensed an endless supply of beer and homemade Bosnian fare. After enjoying a few welcome drinks we retired to our cabin rest up for our rafting adventure the next day, and ended up meeting the auxiliary welcome party: A scorpion curled up comfortably under Addie’s pillow. Max bid him goodnight and ushered him swiftly out the window with a carefully brandished piece of paper. Needless to say, this experience properly prepped us for the adrenaline-gushing excitement of whitewater rafting the following day, and we remained on our toes for the duration of our enjoyable stay at camp.